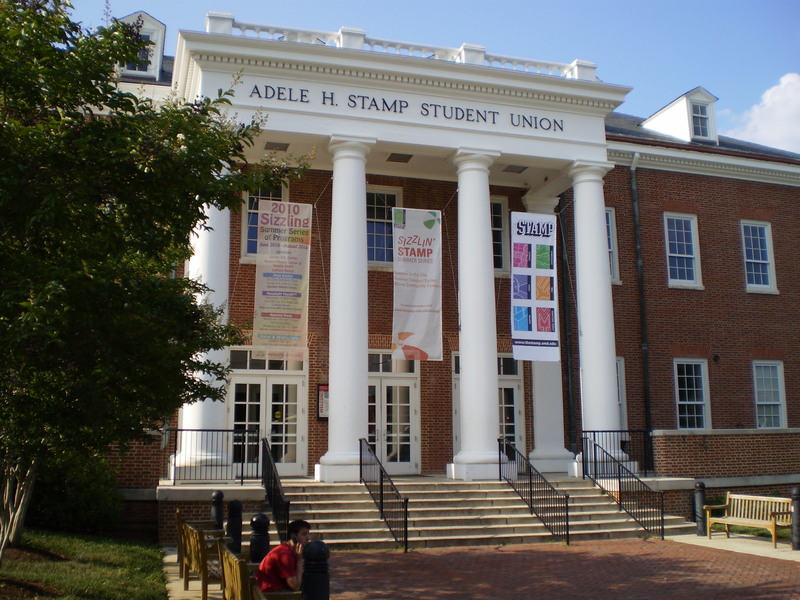 The Adele H. Stamp Student Union, where NHBT’s annual Shabbat dinner was held Friday night. Photo via Wikipedia Commons. As the sun set Friday night, indicating the beginning of yet another Shabbat for the Jewish community at this university, students who are taking part in this year’s National Hillel Basketball Tournament gathered from across the country to celebrate Shabbat dinner at the Stamp Student Union. Hillel members from universities across the U.S.—Kansas, Chicago, Florida, New York and Michigan—gathered to celebrate the tournament, as well as to see friends they hadn’t seen in a year. Although the event has previously been held at the Reckord Armory, organizers decided to host it in a bigger location this year. Leeron Carmi, a junior architecture major at this university and board member of NHBT, said that the goal of the dinner was to give students the opportunity to enjoy each other’s company, so more than 500 people in the old space would have been too crowded. Carmi mentioned that one way to address the board’s goal was to make the dinner available in three separate rooms on the same floor, so that members could go from room to room should they choose to. Stamp gave the NHBT directors the space to make that happen. “One of our goals is to bring old friends together and make new ones,”she added. Kornblum also mentioned that having won twice in the tournament Friday, he was “hoping to cause some damage” before the final round of tournaments on Sunday. Sam Cohen, a student at Yeshiva University in New York, said he came to the dinner because he “wanted to spend some time” with friends from Yeshiva and wanted to reconnect with others he met in previous years. There were other members of the community who attended the dinner as well. Lexi Kubrick, a student at this university, said she attended the dinner as a volunteer after helping organize the event and that she was excited for the games that start Saturday night. “I think tonight is the hallmark of the event,” said Carmi of the dinner in respect to the tournament as a whole, “because whether you like basketball or don’t like basketball, everyone likes food,” and that the dinner was a great way to bring people of the same faith and culture together. No Replies to "Students celebrate Shabbat dinner with old, new friends to kick off annual NHBT weekend"